Last Friday was Part Deux of our Carpe Vinum Old World vs. New World white wine tasting and pairing extravaganza. (Carpe Vinum is the fun and academic wine club I’m a part of — we’re not always academic, but we always have fun). And wow . . did we eat and drink some amazing things. Prepare to be jealous! But before you turn green . . . if you missed Part Un of our Old World vs. New World tasting (the reds), you can read it here. And my background/research post about the differences between Old World and New World wines is here. Let’s belly up to the bar, shall we? **New World Sauvignon and its pairing was my assignment. 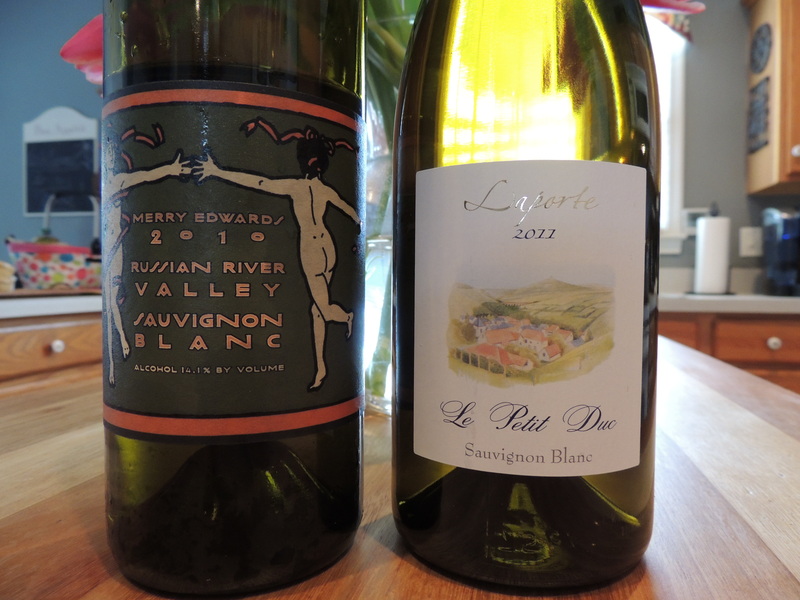 New World Wine Notes: The first time I tried a Merry Edwards Sauvignon Blanc, it was the stellar 2007 vintage. I remember it because it was the night before my grandmother’s funeral (in wine there is solace) and because it was one of those toe-curling, life-changing wines for me. The wine was simply stunning (if you’re into scores, Wine Spectator scored that vintage 96 points — worth every point, maybe more). The 2010 does not disappoint. It’s crystal and pale in color. Smooth, almost creamy mouthfeel. Loaded upfront with pear and melon notes. Lovely, Riesling-esque mineral notes through the mid-palate. But, just to remind you you’re drinking a Sauvignon Blanc, it finishes with a zippy herbal backbone. 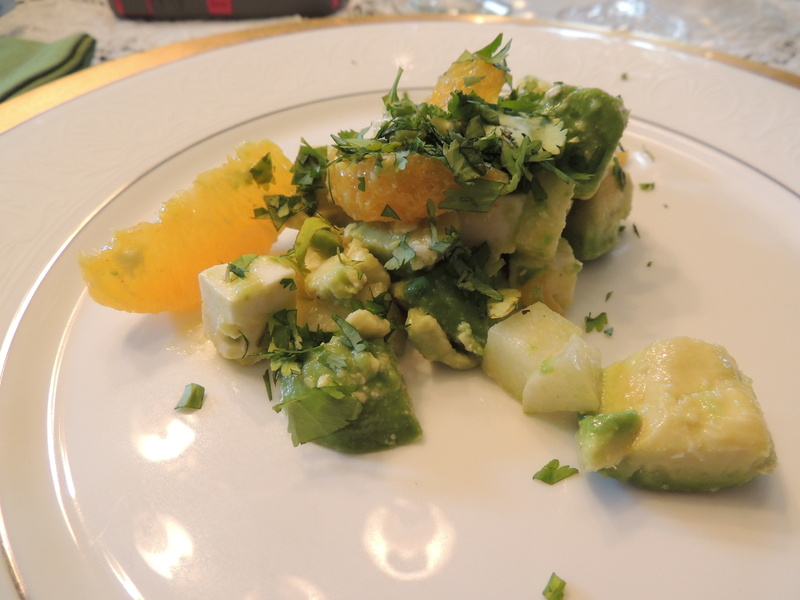 New World Food Notes: Avocado, Orange and Jicama Salad. A beautiful salad, it tastes every bit as good as it looks. Very refreshing — like eating a plate full of spring. I photographed my girlfriend’s salad, because it looked prettier with the cilantro on it. But that’s as close as I get to cilantro. Because cilantro is my Kryptonite. All the flavors in this salad work well together (except for that damn cilantro). The jicama provided a surprising crunch to the dish. I will definitely be making this more often as we move into warmer months. 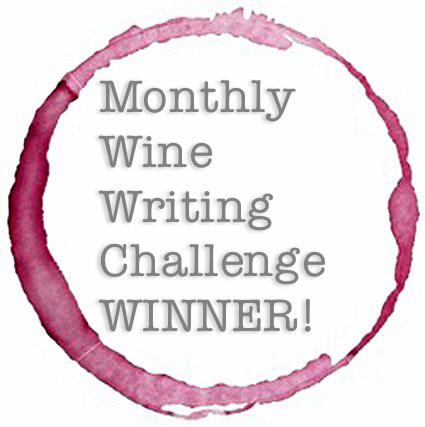 Pairing Notes: Zippity-do-dah! The creamy mouthfeel of the wine was a perfect complement to the texture of the avocado. And the oranges worked wonderfully with the pear and melon notes in the wine. Even a bite of jicama solo with the wine was dynamic. My girlfriends told me the wine was an excellent partner for the cilantro, too. I took their word for it. Old World Wine Notes: Laporte Le Petit Duc is a Sauvignon Blanc from the Loire Valley of France. Very pale yellow in color. Light bodied, fresh, crisp. Subtle flavors of green pepper with an oregano finish. Not especially thought-provoking, but easy to drink and totally uncomplicated. Think summer patio wine. $12. 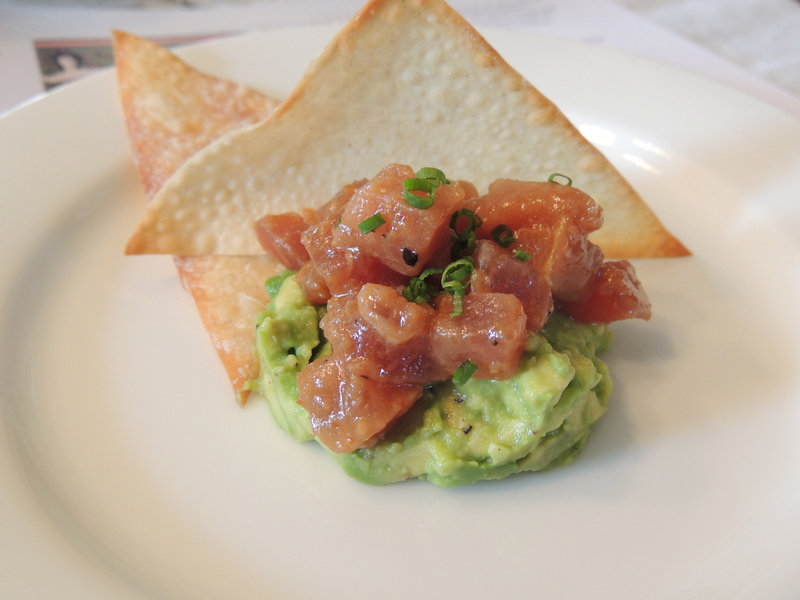 Old World Food Notes: Spicy Tuna Tartare. I’ll be honest. I don’t eat a lot of sushi. Eating sushi is like playing Russian Roulette. I look at every bite and wonder, is this poison or tasty-fish? My girlfriend made a special trip to the sushi department at Wegmans to catch their sashimi-grade tuna (sashimi is Japanese for all but guaranteed not to send you to the emergency room) as it was being unloaded from the truck. And it was soooo worth the trip! I was ready for the tuna to taste like an aquarium, but it just tasted clean. Not fishy at all. This dish is enough to turn me into a sushi lover. Or at least a part-time sushi lover. The sesame oil was key — sesame oil and tuna go together like like rama lama lama ka dinga da dinga dong. (If you don’t get my reference, you’re probably too young to be drinking wine). We all agreed the tuna could have handled a bit more heat, but I’d always rather err on the side of not enough heat than too much. I don’t like food that tastes like pain. Pairing Notes: A lovely pairing. The Sauvignon Blanc emphasized the sesame flavor in the dish, but since I loved the sesame, it worked for me. And the acidity in the wine increased a bit with the tuna. But it wasn’t a jarring increase. I purposely saved a bite of my tuna to try with the Rieslings (read below), and that was amazing, especially with the Donhoff. 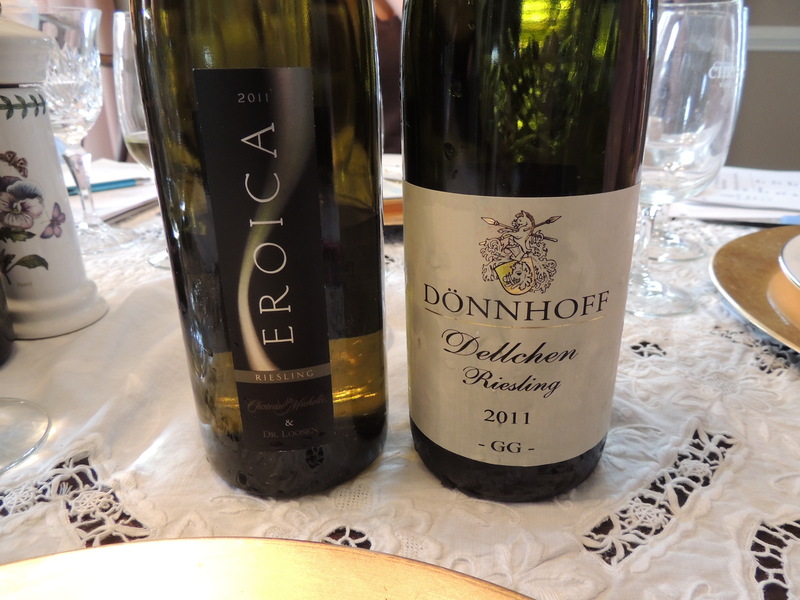 New World Wine Notes: I’ve tried the Eroica Riesling a few times before — it’s consistent ever year. There’s definitely more residual sugar in this wine than in the Donhoff Riesling (see below), though. I swim upstream on Riesling, and prefer a bone-dry style, so my nod went to the Donhoff. The nose on the Eroica is more subdued, a big whiff of peach cobbler. Flavors are green apple and key lime pie with trace mineral notes. Well balanced acidity. 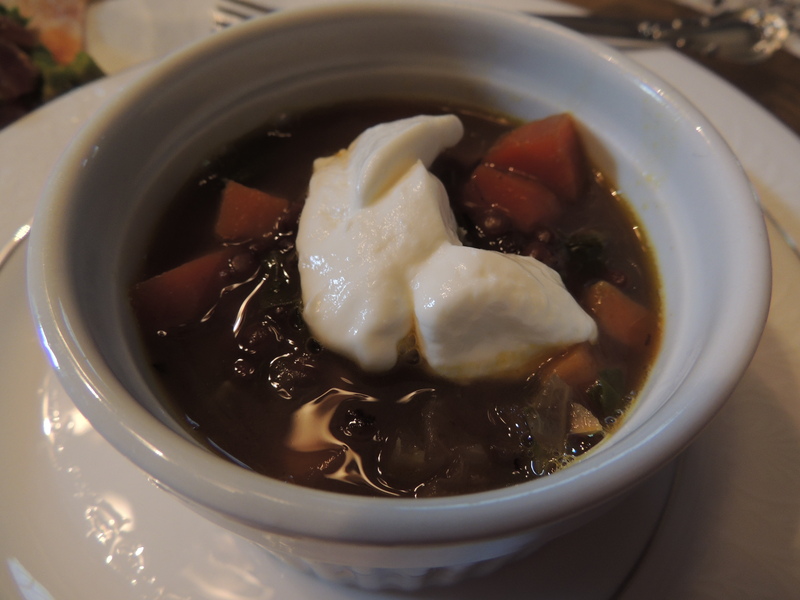 New World Food Notes: My girlfriend made her very yummy Curried Vegetable Lentil Soup for her pairing. She used special black lentils she bought at a farmer’s market. I’ve never had lentils so tiny and tasty before. Now I have to go track down tiny black lentils. This soup is so hearty and rich, yet astonishingly healthy. I feel like I’m eating something naughty, but I’m not. 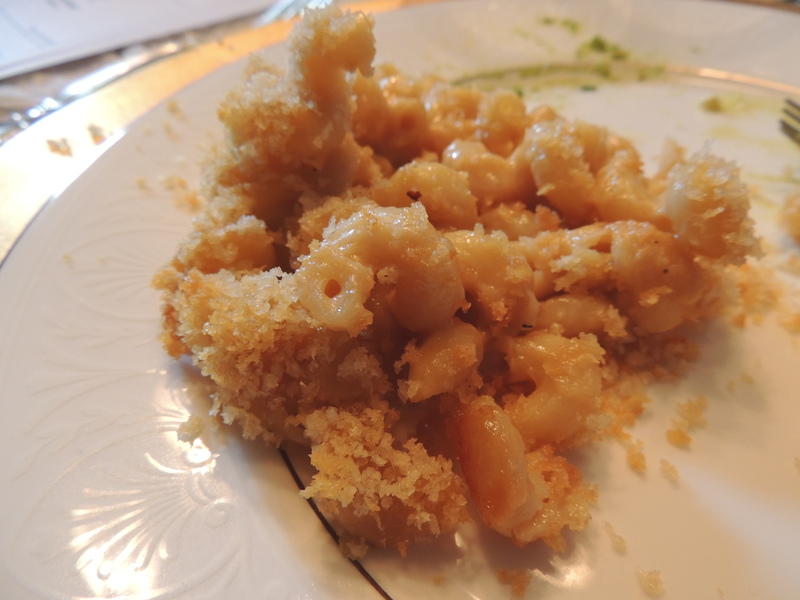 My friend Diane created this recipe, and she’s given me permission to post it for you. Thanks, Diane! Cook onion in oil for about 10 minutes. They should be a bit caramelized. Add carrots and celery and cook for about 6 minutes, until softened. Add garlic, cook for 1 minute. Add salt, pepper, curry and cumin. Sauté for about 1 minute. Add lentils and 6-8 cups chicken broth. Bring to a simmer and cook for about 30 minutes. Add potato and cook for another 15 minutes. Add kale and lemon juice. Serve with a dollop of Greek yogurt on top. Add more broth for a thinner soup. You can also add 2 apple sausages (diced) for a non-vegetarian meal. Pairing Notes: The Eroica Riesling was a beautiful partner with this soup. It balanced the curry and cumin notes to perfection. Is there no end to the versatility of Riesling? But I’m thinking . . . because it’s still cold outside (it snowed this morning, for Pete’s sake — stupid March), I would love to try this soup with a Pinot Noir or a Cru Beaujolais — there’s a hearty earthiness to this soup that screams fireplace and red wine. Unless it’s July. Then it’s going to scream air-conditioning and Riesling. Old World Wine Notes: I love this wine. I knew I’d love it from the moment I stuck my nose into the glass. Don’t you just love wines like that? The nose is so clean and inviting. It smells like wet rocks drying in the sun on the side of a crystal clear stream in the mountains of Colorado. What can I say, the wine triggered a very specific smell memory for me. Peach, petrol and Silly Putty notes jump out of the glass and into your mouth. Deliciously dry. Grapefruit on the back end. Superb acidity balance. This would be über-fun to try again in about 10 years. 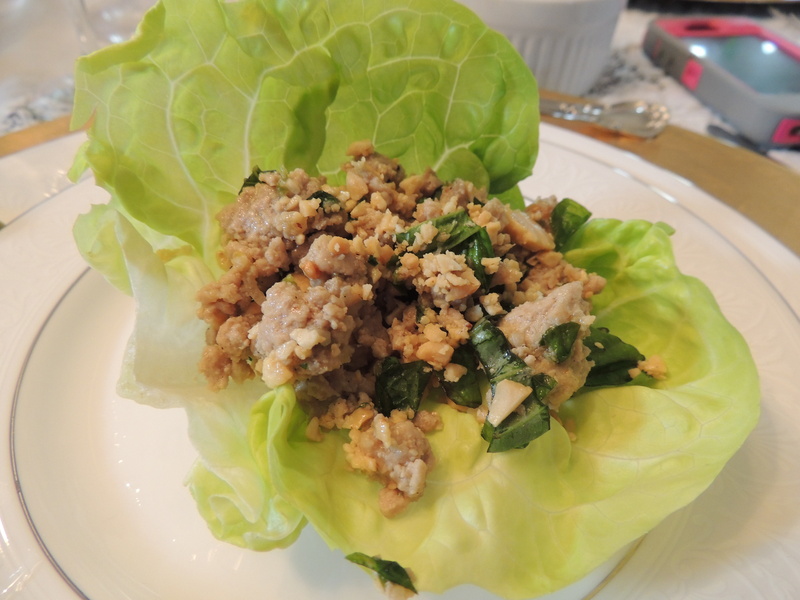 Old World Food Notes: Thai Ground Pork Salad. Wow, was this yummy! You know food is good when everyone is humming . . . mmmmm! It was perfectly spicy. And did I mention there are peanuts in it? Fabulous. The hint of mint is subtle but definitely value added. And my girlfriend loves me . . . she put the cilantro on the side. Bonus: you get to wrap it all up in a guilt-free lettuce shell. I love food that’s fun! Pairing Notes: Riesling is a chameleon wine. It changes itself to match with almost anything. The Donhoff was a superb match to the spicy pork and peanuts. The clean acidity in the wine complimented the heat in the food. Tough to decide which is better . . . the wine or the food. Gorgeous. New World Wine Notes: I really liked this wine. I was expecting a Sonoma oak-bomb, but it was surprisingly restrained. Greener in color than the Drouhin. Tastes like a pineapple upside down cake, with its smooth tropical flavors and vanilla butter finish. Lush without being flabby. I’d definitely buy another bottle of this one. Preheat oven to 375 degrees. Butter a 4-quart shallow baking dish. Place garlic on 10-inch piece of foil. Drizzle with olive oil and crimp shut. Place on small baking sheet and bake 30 minutes until tender. Cool 15 minutes, squeeze cloves out and into a small bowl. Mash into a smooth paste. Melt 2 Tb. butter in medium bowl. Stir in 1/4 tsp. salt until dissolved. Stir in Panko until well blended. Melt remaining 4 Tb. butter in large saucepan over medium heat. Add flour; cook and stir until light brown. Stir in roasted garlic paste, remaining 1 tsp. salt and pepper. Slowly whisk in milk and stir. Simmer until thickened, whisking constantly. Remove from heat. Whisk in cheeses, 1/2 cup at a time until melted. Combine cheese mixture and pasta in large bowl. Transfer to prepared baking dish. Sprinkle evenly with Panko mixture. Bake 40 minutes or until bubbly and topping is golden brown. Let stand 10 minutes before serving. Pairing Notes: An excellent pairing. The heavy cheeses and cream worked very well with the creamy, butter notes in the Chardonnay. I’d love to throw in some prosciutto or Virginia country ham and revisit with a Pinot Noir. Old World Wine Notes: Subdued and elegant. The pureness of the Chardonnay grape comes through. A golden color in the glass, with flavors of lemon and apple. The acidity seems a twinge more aggressive than the MacRostie. There’s a metallic steeliness to the wine that screams out for seafood. Not sure I would seek it out, but if someone poured me a glass, I wouldn’t refuse it. Old World Food Notes: If you’re wondering what to make for dinner this weekend, wonder no more. 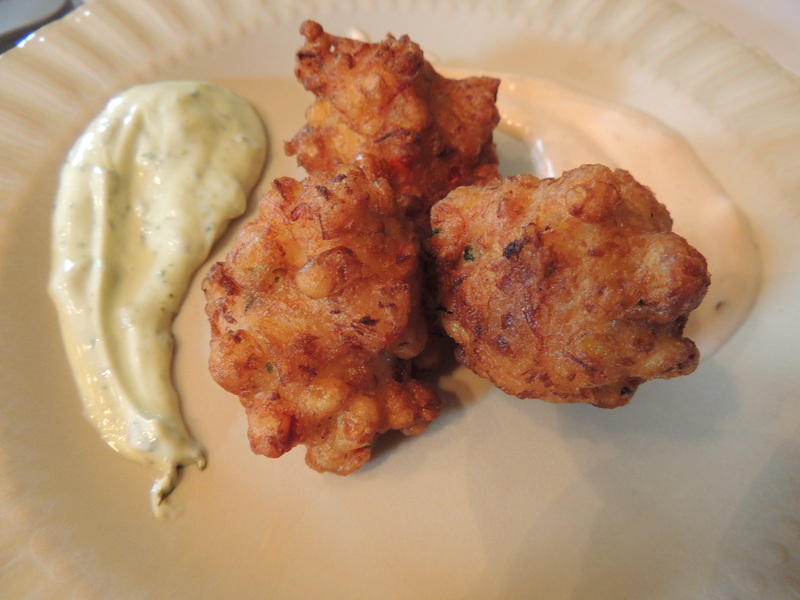 Make Lobster & Corn Fritters with Chipotle-Lime Mayonnaise. And Basil Mayonnaise. My girlfriend couldn’t decide between the two sauces for her pairing, so she made both. Lucky us! Because after tasting the sauces with the lobster fritters, I couldn’t decide which sauce I liked more. So I ate both! And then, even though I was stuffed beyond stuffed, I had seconds. These things are flipping fantastic! 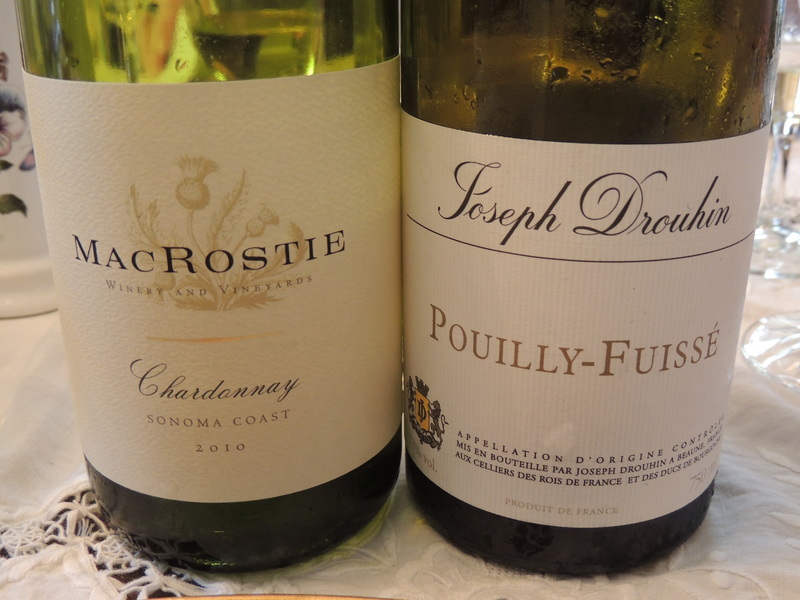 Pairing Notes: The Drouhin was almost too restrained and elegant for the lobster fritters. Because the fritters are fried, there’s a buttery heaviness to them that seemed to match better to the weight of the MacRostie. If the Drouhin was a song with the lobster fritters, the MacRostie was a symphony. Not that any of us had room for dessert . 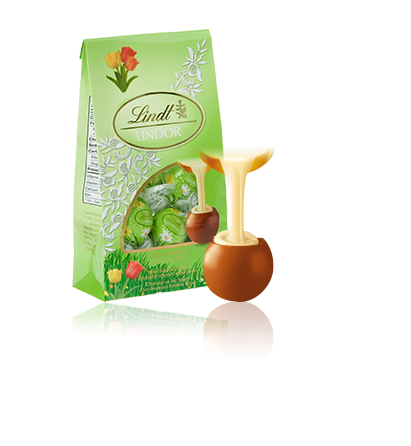 . . but there was a dish of Lindt Springtime truffles (white chocolate truffles covered with a milk chocolate shell) on the table. They were taunting us. So we ate them. Chocolate truffles are a fresh hell with white wine, but we worked through it. That’s it for this episode of Carpe Vinum. Stay tuned next month for our take on Iron Chef: Asparagus + Pairings! Previous Post: The Best Writing Advice Ever . . . Thanks, Hem! Great post, very jealous of the food and wine pairing. It sounds amazing. The photo’s are fantastic and the wine choices sound great with each dish. My girlfriend bought tiny black lentils at a farmers market in Philly. They were the tiniest lentils I have ever seen! She said they don’t absorb as much moisture as the larger ones. I tried to find some at our Wegmans, but no luck. The only thing I found were the split red lentils . . . so if you use them, please let me know how it turns out! Salud!! What a great post: The tasting seems like fun, the food looks delicious and your notes are absolutely awesome! Great, great job. One remark regarding Eroica vs. the Dönnhoff. That is the big problem with Rieslings, that one has to be extra careful about whether it is sweet or not. And the bottles don’t let it on…What you had was Dönnhoffs flagship dry wine, which can be identified by the GG on the bottle, which stands for Grosses Gewächs (Great Growth). 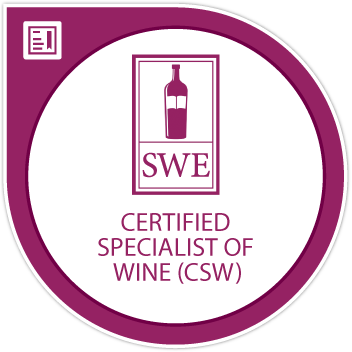 It is the designation that the elite winemaker association of Germany VDP allows to be put on the best dry wines from the best vineyards only. So, in a way, this tasting was unfair to the Eroica. But you got to try an amazing dry from Germany. 2011 was an awesome year for dry Rieslings from Germany in general, but as you said, this should be truly great in a couple of years. Thanks so much! I think that’s a nice way of putting it . . . the tasting was unfair to the Eroica. The Donhoff was amazing!! Will definitely seek out more GG!! ;o) Prost! Thanks so much, Kathleen . . . Cheers!